Voted Dallas and Fort Worth’s Best Nanny Agency! Thank you for considering Nanny Poppinz of Dallas and Fort Worth. As the leading Nanny Agency in the nation, Nanny Poppinz is a company founded and built on one simple philosophy...YOUR needs, children and family come first. You can use our Nanny services at a moment’s notice with our "live" nanny call center available to Dallas and Fort Worth 24/7 including evenings, holidays and weekends. A "Live" Nanny call center available to Dallas and Fort Worth 24/7 including evenings, holidays and weekends. All Dallas and Fort Worth Nanny referrals have 3 years verifiable Nanny childcare work experience and CPR certification including AED and First Aid training. Each Nanny is legal to work in Dallas and Fort Worth. Emergency Nanny childcare service and 6 month Nanny replacement guarantee for all full and part time Nanny Poppinz Dallas and Fort Worth families. This Nanny replacement guarantee is the best in the Nanny industry. Proudly offers Nanny referral fee discounts to Dallas and Fort Worth TX military, law enforcement and Federal Government families. Throughout our years of working in different childcare facilities, for different nanny agencies, and as nannies for numerous special families, we have decided how we would want to run our own Nanny business. We want to offer a personalized relationship with our families and Nannies by genuinely taking the time to talk with our Dallas and Fort Worth families and understand their specific Nanny childcare needs, requirements, and Nanny expectations. Our nanny background check includes a criminal file multi-county/multi- state misdemeanor and felony check, social security verification, driving record checks, internet checks and establishing that each Nanny is legal to work in the US. Our Nannies are all 18 or older and legal to work in Dallas and Fort Worth. Each Nanny Poppinz Nanny is FULLY READY TO HIRE when you interview them. Combine this kind of dedication and concern for detail with the most sophisticated and probing Nanny Background checks in the industry, and you can see why over 40,000 families have successfully found Nanny childcare solutions through Nanny Poppinz. Call us at any time to set a time for an interview. FREE, Nanny and Family CPR Classes are held monthly in Dallas and Fort Worth. Please contact Amber, owner of Nanny Poppinz Dallas and Fort Worth, at amayhew@nannypoppinz.com to arrange to attend a Nanny or Family CPR class. Prospective Dallas and Fort Worth Nanny Poppinz Nanny Interview Schedule For information on how to become an Dallas and Fort Worth Nanny Poppinz Nanny and to schedule a Nanny interview please call 512-879-4177, ext 2. My name is Amber Mayhew and I have been working in the family services field in the Dallas and Fort Worth area since 1998. I am a Nanny, NICS, Birth Doula, and last but certainly not least, a wife and a mom! I love working with Dallas and Fort Worth families helping them solve their childcare needs. As an Dallas and Fort Worth parent myself, I know how important your children are to you. I also know how important your time is. I am always available for my families and Nannies to reach me directly, because I know sometimes families can only discuss Nanny candidates after work, after the kids are in bed, or on the weekends. 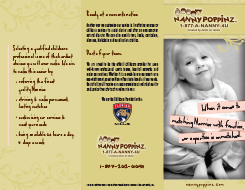 As the local owner of the Nanny Poppinz agency in Dallas and Fort Worth you have my personal guarantee that the first priority at Nanny Poppinz of Dallas and Fort Worth will always be the safety and welfare of your children. I also understand the importance of finding the best possible Nanny care for your most precious assets.